BIKE REPAIR KIT ample for common road repair on standard mountain bikes. If your bike has nonstandard components, come prepared. LIGHT TENT backpacker style, not the bulky, heavy types. BIKE must be in good repair. You can rent most of the items listed above in our Rental Sleeping Kit. We offer two varieties, our basic sleeping kit which includes a sleeping bag, sleeping pad, small pillow, rain gear and cup for $40.00, or the same basic sleeping kit with a two-man tent for $65.00. Rentals must be reserved in advance. Water bottles & Mugs are available for purchase in our store. Water bottles are not included in the rental kits. Holiday rental bike with helmet is available $170.00/bike; if personal bike fails to meet minimum safety standards you will be asked to rent a Holiday bike. Holiday rental bikes come with platform pedals only. If you have clipless shoes you MUST bring your own pedals. LONG UNDERWEAR (optional) med. weight polypropylene/synthetic type. Things not to bring on your trip - glass-bottled beverages, radios, firearms, pets, and large amounts of cash beyond what you’ll want for your guide’s gratuity. Do not bring expensive jewelry, watches or electronics i.e. cell phones, laptops, tablets, etc. Warning: In the event of a loss regardless of fault our insurance will not cover these expensive items. **If you do decide to bring any of these items along with you to the meeting point for your trip, the most secure location to leave them behind would be at your hotel in their safe or locked up in the trunk of your vehicle. As a last resort we have a non-secure location at our headquarters, but we cannot assume responsibility for these items. There is a greater chance of inclement weather on these trips which otherwise offer many advantages to the well-prepared river traveler. Smartwool, fleece, pile, capeline, etc. are a few examples of trade names for a class of synthetic materials that retain their ability to insulate when wet (please note, cotton does not). Your comfort on the trip starts with finding the right type of synthetic under and outer-wear and quality rain gear. 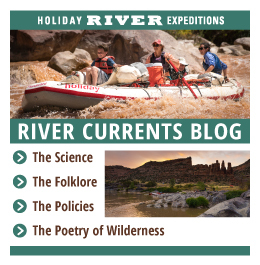 We recommend Backcountry.com for your additional river trip needs. They offer a wide variety of gear to help you dress for success while on your river trip. A prepared traveler is a happy traveler. HELMET required - no exceptions, ANSI or SNELL approved.